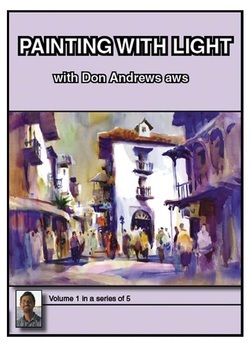 you too will create dynamic paintings filled with sparkling light. Luminous granular washes make watercolor special as a medium. Don walks you through the process of mixing colors on the page to create glowing granular washes. Then watch over his shoulder as he applies granulation to a full sheet landscape and figure painting. Once you understand how to create granulation you'll fall in love with watercolor! Approx. 90 minutes. 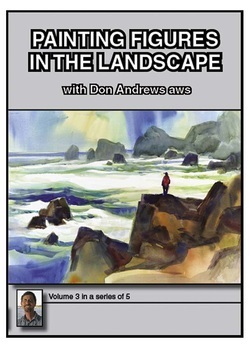 Lose your fear of painting figures in your landscapes today! Don explains the common mistakes we all make in several demos that are easy to follow and make painting figures fun. Then he brings figures to life in two finished landscape paintings. ﻿Here’s the DVD we all need! 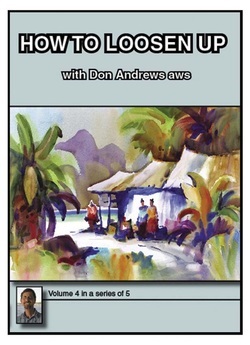 Don shows you how to overcome tight watercolor paintings in two demos that reveal how watercolor can be kept loose throughout the painting process. Then he uses these concepts to do a loose and juicy tropical landscape painting that will pop your eyes. Painting with negative space is what the pro knows how to do that the amateur aspires to. Don’s logical demonstrations make utilizing negative space easy to understand. Then watch as he does a beautiful landscape and still life painting totally with negative space. 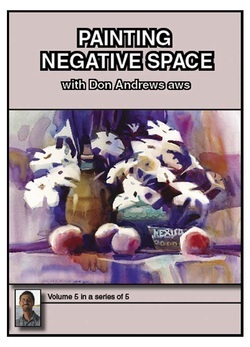 Don says understanding the use of negative space can turn an ordinary painter into an extraordinary painter.